A charming wooden pulling peddling duck. This charming and smiling pulling peddling duck will be the eternal compagnon of your child. Pull the duck and the head will move and the wings will go up and down. So charming! The duck is hand made and produced out of sustainable natural wood. This wooden toy is not only fun to play with but also stimulates the development of the gross and fine motor skills of your child and its fantasy world. This wooden duck also suits perfectly as decoration for your child's room. 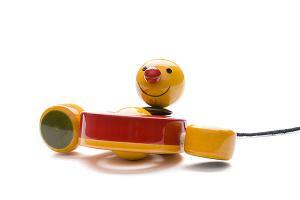 This wooden pulling peddling duck is part of our indi coloured toys series. This series consists of our wooden toys coloured with paint made of vegetable extracts, resulting in warm and beautiful colours. Each wooden toy of our indi coloured toys series is individually branded by the natural grains of the wood and the touch of the craftsman.